Finally, a new episode shows up, but what does my darling DVD player decide to do? Yep, no picture, only sound. Not the way I want to admire my favorite gate travellers. So, I've bought a new one - a Philips. It was the only one in the store which could do DivX and could be switched to codefree. I thought it was interesting that the second information was written by hand on the sign - looks like I'm not the only one interesting in code freeness. Here it's draped more or less elegantly over my new office chair. 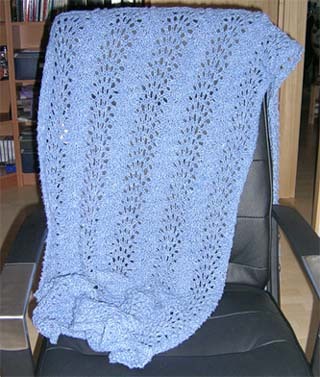 It's a simple feather and fan pattern and the wool is called Zoom. Knitting wise I've moved back to finish a pair of socks, and on the stitching front, I've picked up the 'Northern Lights Sampler' which I've negleted for so long. Yeah, 'Voyages at Sea' is done. Took me quite a while, but it was my travel project and there were interuptions, so it wasn't too bad. I really like how it came out. Really nice. I've also finished the big secret, which needs to to be a secret a little bit longer, but then I can show it of. Well, big question is what to do next. I've got a second design from the same guy who did 'Voyages' as a kit, so this is a possibility, though probably not right now. Then there's a couple of Teresa Wentzlers, but most of them are not very good travel projects as they need so many colors, so maybe something else. Good chances are that I go for something from Dragon Dreams. I've got one designe ('Not Forgotten') pretty much kitted up (missing only the DMCs), so this is a good canditate. ...and there's still some knitting to be done. 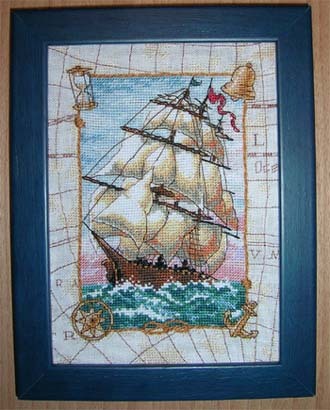 Well, I've finshed all the cross stitch on the big secret and also all the cross stitch on Voyage on the Sea. Meaning I'm off to backstitch - and both projects have plenty of it. Oh happiness oh joy. 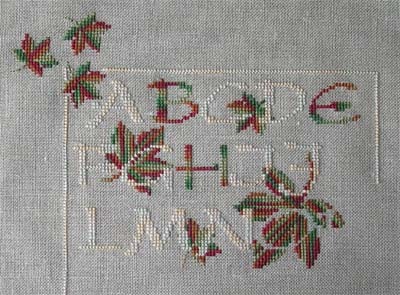 To get some fun stitching in, I've started with this fall alphabeth. I adore how the smaller leaves come out, but the bigger leaves are a bit strippy. Still, it's fun.